Chiropractic is a branch of the healing arts, which is based upon the understanding that good health depends, in part, upon a normally functioning nervous system (especially the spine, and the nerves extending from the spine to all parts of the body). "Chiropractic" comes from the Greek word Chiropraktikos, meaning "effective treatment by hand." Chiropractic stresses the idea that the cause of many disease processes begins with the body's inability to adapt to its environment. It looks to address these diseases not by the use of drugs and chemicals, but by locating and adjusting a musculoskeletal area of the body, which is functioning improperly. The conditions which doctors of chiropractic address are as varied and as vast as the nervous system itself. All chiropractors use a standard procedure of examination to diagnose a patient's condition and arrive at a course of treatment. Doctors of Chiropractic, (DC), use the same time-honored methods of consultation, case history, physical examination, laboratory analysis and x-ray examination as any other doctor. 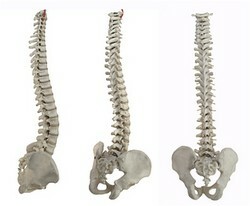 In addition, they provide a careful chiropractic structural examination, paying particular attention to the spine.